Gov. Matt Bevin is feuding with the Republican leaders of the state legislature after he vetoed the pension bill that passed on the last day of this year’s legislative session. The bill would have allowed regional universities and other agencies to exit the state’s pension system to avoid a spike in their pension costs. It would have also allowed the state to take over the agencies’ finances if they default on pension payments and suspend benefits of their retirees. Bevin has promised to call a special session in the coming months for lawmakers to pass a new version of the bill. On Thursday, Senate Majority Leader Damon Thayer called Bevin’s veto a “big disappointment” and said it’s now the governor’s responsibility to come up with a solution. “I’m exasperated right now, I know all of our members are. If the governor wants to call us into a special session, which I’m not in favor of frankly, he needs to come with his own bill and he needs to make sure he has the votes that can pass both the House and the Senate,” Thayer said. Thayer’s comment hearkens back to when Bevin called a surprise special session on pensions last December and lawmakers voted to adjourn after about 24 hours without passing anything. At the time, Thayer said he had urged Bevin not to call the special session because lawmakers hadn’t yet come to an agreement on how to address the pension issue. This week, Bevin said that he vetoed the pension bill because it would have hurt the state’s finances and left the state vulnerable to a legal challenge because of the provision allowing the state to suspend retirement benefits. On Thursday, Thayer said he didn’t think the bill was illegal and that the legislature could come back and “fix tweaks or hiccups” when it returns for the next regular session in January. Bevin’s recent actions have once again put the governor at odds with his typical political allies in the legislature. On Wednesday, Senate President Robert Stivers called Bevin’s veto “perplexing” in a statement, saying that the bill was consistent with an earlier version that the governor had voiced support for. Stivers urged Bevin to come to an agreement with lawmakers about what a final version of the bill should look like before calling a special session. “Before the Senate is called into an Extraordinary Session, the Governor should set the parameters for what he is willing to sign. We need a bill to address this problem which is actuarially sound, is able to pass both chambers, and can withstand political and legal scrutiny,” Stivers wrote. Bevin fired back at Stivers late on Wednesday in a letter, saying he was “disappointed and perplexed” by the Senate Republican leader’s comments. “Your comments released today to the media, indicate either a remarkable misunderstanding of the legislation you voted for, or an intentional misrepresentation of the facts,” Bevin wrote. The pension bill would have affected regional universities like Eastern Kentucky University, Western Kentucky University and Murray State as well as quasi-state agencies like local health departments, some of which say they will have to close if they pay higher pension costs. But the bill would also ding the funding level of the pension system used by most state workers, which is among the worst-funded in the nation. “It does leave a bit of a struggle to try to figure out what to do beyond this. And what would be palatable to the governor that he would sign and feel comfortable with but would also be palatable to the stakeholders as well as the 138 members that have to vote on this,” Osborne said. Bevin said he will call a special session sometime before July 1. Reporter Stu Johnson of member station WEKU contributed to this story. Gov. 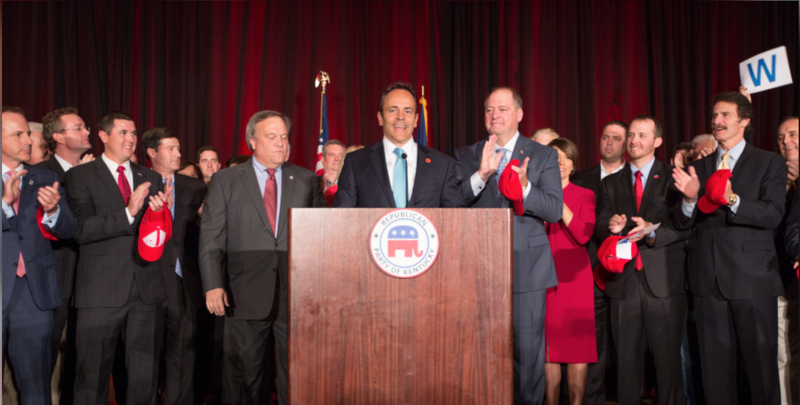 Matt Bevin has vetoed a bill that would have provided some financial relief to regional universities and agencies like local health departments that are facing massive increases in the amount they have to pay in to the state pension system. Bevin also said he intends to call a special legislative session to address the issue before July 1 of this year. House Bill 358 would have allowed the agencies to exit the pension systems and create their own retirement plans, but would have increased the state’s unfunded pension liability, which is currently among the worst in the nation. The Kentucky Labor Cabinet has subpoenaed Jefferson County Public Schools, in relation to teacher-led sickouts that forced the school district to close six days while educators protested at the state legislature. A JCPS spokeswoman confirmed that district officials received the subpoena Wednesday afternoon, and the district later released a copy of the subpoena. The Labor Cabinet’s deputy secretary and communications staff did not respond to a request for information regarding the subpoena, which was first reported by Insider Louisville. For as many education bills that Kentucky lawmakers passed in the 2019 legislative session, many other proposed measures failed. Whether some of these bills fell flat primarily due to strong opposition from this year’s especially vocal educators or from a lack of unified support from the General Assembly’s Republican majority is still up for debate. On the final day of Kentucky’s legislative session, lawmakers passed major financial legislation dealing with pensions and taxes, and a host of other measures like a statewide ban on tobacco in schools and a requirement that workplaces accommodate pregnant employees. The Republican-led legislature also overrode the two bills that Gov. Matt Bevin had vetoed earlier this week. Bevin still has the opportunity strike down any of the legislation that passed on the last day, but lawmakers will not be able to override any more of his vetoes.